478 pages | 14 Color Illus. | 7 B/W Illus. This book provides a comprehensive and in-depth discussion on the development of herbicide resistance during the past 50 years, emphasizing the biochemical pathways of herbicide resistance in weeds. 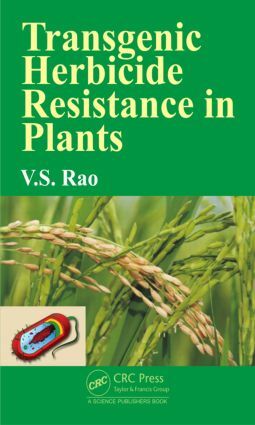 It discusses the principles of plant genetics, different methods of genetic engineering, makingof transgenic plants, various transgenic crops conferred with herbicide resistance, evolution of weed, problems subsequent to growing of transgenic crops, benefits and risks of growing transgenic crops, and management of transgenic crops. Packed with up-to-date information, the book includes relevant references, data, figures, and illustrations. Introduction. Development of Herbicide Resistance. Mechanisms of Herbicide Resistance Evolution in Weeds. Plant Genetics. Genetic Engineering. Making Transgenic Crops/Plants. Transgenic Crops Conferred with Herbicide Resistance. Herbicide-Resistant Weed Evolution following Transgenic Technology. Benefits and Risks of Transgenic Herbicide Resistant Crops. Management of Transgenic Crops. Appendices. Index.